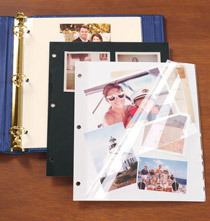 Create the elegant look of a traditional book bound scrapbook photo album with Designer black 3-ring photo album pages. I purchased these for a client and he was very impressed by the professional look and quality feel of the pages as well as the interleaving. I will definitely be reordering. 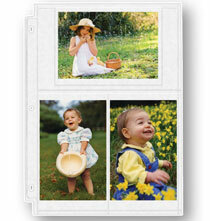 These pages are excellent for affixing photos and mementos into a gift or memory album. Use contrasting photo corners and then add captions by pen. 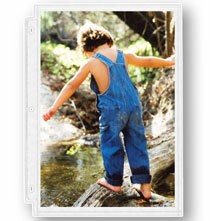 For a special touch, use a gold or silver ink on black background, which makes the photos and captions pop. Love the velum sheet in between to protect the photos and being able to use both sides to fit more images in each book. Old style album pages redesigned! I ordered these pages and an album to store some old photos of varying sizes that had been lying around in boxes. Using traditional photo corners, I can group them any way I want. 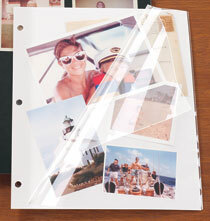 (Many photo pages, while easier to use, only permit one size per page). Also, I am finding that photos displayed even in the very best vinyl pages are harder to see and may have diminished quality because of the reflection of light on the page. The lovely white cover sheets with each page are very pretty and add a nice touch. I have used this before. Looks sharp in an album. I have been using these for years for my albums of our family history. They add an elegance and professional look to these special memories. I just like the way these photo pages look; the black makes the photo's pop and the overlay page just looks elegant plus provides protection to the photo's. I have used these pages in many albums. They make a beautiful presentation and are easy to use. Make sure you have a white pen with which to label them! I like the way the photos appear through the film. It looks elegant. I love these pages for making scrapbooks of trip memories. Makes a very classy photo album ! I love these. They are solid black sturdy sheets. I used the black sticky corners (Exposures no longer carries). I have purchased these for years and been very happy with them. Items display very well on a black background. This gives the albums such a beautiful classic photo album look. They paper stock is extremely high quality; and, the black color shows off photos so nicely. Love the way these make my albums look! I have seen them used in person and quite like the finish of the page. It seems small on the screen but it fits the 11x11 albums very well. it looked very classy and elegant..waiting 2 get in mail soon..
Time to finish a Halloween scrapbook that I purchased (from Exposures!) years ago! I keep an album of food and wine memories. I like to use these pages to attach menus and photos of special meals and wine experiences. 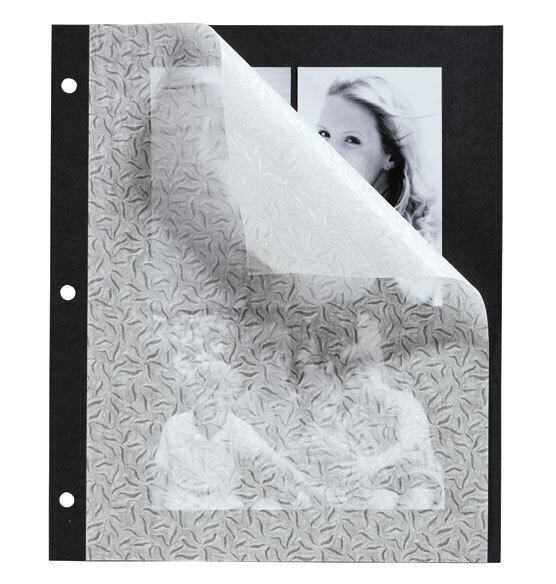 I have bought and used these pages in all my scrapbooks from Exposures for years. Everything shows so well on a black background. I love creating albums for birthdays. Guests write a sentiment on a small notecard that I have prepared. Then I paste them all into a 3 ring engraved album and it is a timeless and thoughtful keepsake. Is item 309338 double sided? BEST ANSWER: I wish I could help but I bought them to include in an album. I have the album as a wedding gift so I never opened the package of pages. I have bought pages in the past from exposures and they were double sided. The pages are double sided. There is a rice paper separator between each of the pages. The only downfall I have found is that you have to use a white pen to write on the pages. Otherwise, I love the pages. I'd like to know if there are sheet protectors on both sides. There are not sheet protectors on these pages, just the rice paper page between each page. I have found that I prefer the pages with just the rice paper. I have eight of these oversized albums, five with ivory pages and three with the black pages. I have never had any trouble. Does that address your question/concerns? Is the ivory no longer available? BEST ANSWER: Thank you for your question. The Designer pages only come in black. The Ivory is no longer available. We hope this information will be of help to you. What albums do these fit? Customer service was less than helpful when I called. BEST ANSWER: Thank you for your question. This will fit any of our three ring albums. We hope this information will be of help to you.